Nations Cup record: Nine previous appearances. Best finish: Champions (1962). A founder member of the Confederation of African Football (Caf), Ethiopia were one of just three teams to participate in the inaugural Nations Cup in 1957 - losing that year's final, before lifting the trophy on home soil five years later. Regulars at the first seven tournaments, the emergence of more nations in the wake of post-colonial independence meant Ethiopia was caught up by the rest of the continent - and the fact that Africa's second largest country will be appearing at its first finals since 1982 tells its own story. 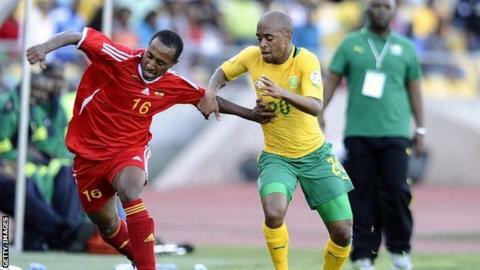 An unexpected - and unlikely - revival was pulled off in dramatic fashion when Ethiopia overturned a 5-3 deficit away to East African rivals Sudan in the first leg of their third round qualifier, winning 2-0 at home to qualify on away goals. The last time Egypt played in the tournament finals they also met Zambia and Nigeria - fans will not want a repeat of the respective 1-0 and 3-0 defeats, but realistically they will not expect much better. Coach Sewnet Bishaw, who is in his second spell at the helm, admits his side will need to tighten up at the back. "Hard work and unity are our strengths," he said. "We succeeded because of intense training and a high level of discipline. I just hope we can learn from some of the silly goals we conceded in Khartoum." The star of the team is striker Saladin Said, who is based in Egypt and has a habit of scoring spectacular goals. There are two other foreign-based Antelopes heading for South Africa - midfielder Yusuf Salah, who plays in Sweden and United States-based striker Fuad Ibrahim. The team plays a a short passing game embossed by some individual flair, but most Ethiopian fans are simply hoping for a credible display in South Africa, rather than expecting another miracle from a team that already pulled one off when returning to a tournament where they were once feared.